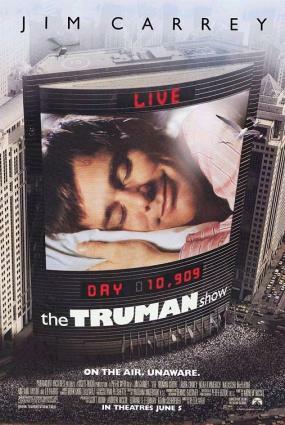 1998's The Truman Show has a plot that's completely implausible. Yet the movie was a hit because it played on a strange atavistic feeling, the feeling probably everyone has had at one time or another - that weird, absurd feeling that "I'm real, but nobody else is." Truman Burbank (Jim Carrey) is a nice guy living a wonderful yet completely normal life. He lives in a nice house in the island community of Seahaven with his loving wife Meryl (Laura Linney). A cheerful fellow, Truman's only tic is his fear of water. The fear can be traced back to his father dying when Truman was very young in a boating accident. That fear has kept him on the island all his life. But nothing is as it seems. Truman's first clue comes one day when he is about to head off to work, and a giant klieg light falls from the sky to crash onto the road. Where did it come from? This baffling mystery feeds into a restlessness that's been growing inside Truman, a desire to see what else is out there that battles with his travel phobia. The audience learns the answer sooner than Truman does. Unknown to him, Truman's life is the subject of a long-running television show that he has been starring in all his life. Seahaven, it turns out, is the world's largest sound stage. The loving wife, the best friend? Actors. The mad genius behind the scenes is Christof (Ed Harris), the producer of The Truman Show. Christof is literally the god of Truman's world. He decides who lives and who dies. It was Christof who "killed" Truman's father, in order to give Truman the phobia that would keep him from trying to leave the island. It was Christof who decided Truman's first love, Lauren, would move with her family to Fiji. What actually happened was Sylvia (Natascha McElhone), the actress who played Lauren, was fired from the show. She was fired for developing genuine feelings for Truman, for coming to believe that he should know the truth about his life. Sylvia is now on the 'outside', part of the protest movement against The Truman Show, while Hannah Gill, who plays Truman's wife Meryl, is a professional - she'll love Truman or hate him, whatever the script calls for. Off the set, we see the people who make up the fandom for The Truman Show. These people have grown up watching Truman. They collect the geegaws and knicknacks. They watch Truman in Truman-themed bars with their Truman-fan friends. As Truman becomes suspicious about his life and begins to investigate and even look for a way out, the whole world watches. And many of them are rooting for Truman to figure it out and make his escape. The Truman Show was directed by Peter Weir and written by Andrew Niccol.